It’s all around us; on street signs, radio, papers, books and most importantly – television. It’s propaganda, and the person who re-popularized the term was Edward Bernays, the nephew of Sigmund Freud. “Propaganda” was written in 1928, at the dawn of serious mass media. Radio had been out for a while, and he makes mention of television and “motion pictures” – which were just beginning to compete with print media. The edition I read had a very thorough introduction by Mark Crispin Miller, which was worth the price of the book by itself. Weighing in at 168 pages, “Propaganda” is a simple and quick read, pretty straight-forward if not a little silly in it’s early media-era presentation. The word propaganda goes back to early Catholic teaching in the form of “The Office for the Propagation (propaganda) of the Faith”. Initially, the term had a positive connotation which changed during World War 1 with the Anglo-American effort to demonize “the Hun”. From that point on, public opinion was destined to be “managed”, with puppet-masters like Walter Lippmann devising ways to “manufacture consent”. “The conscious and intelligent manipulation of the organized habits and opinions of the masses is an important element in democratic society. Those who manipulate this unseen mechanism of society constitute an invisible government which is the true ruling power of our country”. “…regiment(ing) the masses according to our will…” is part of daily life for a global population in every form of corporate and government operations. Consider modern television advertising. Half the adds want you to ask your doctor about this pill or that treatment. Everything down to the music, lighting, multiculturalism, graphics and rapidly formatted warnings are there to worm into your subconscious. How many times have we been told that petroleum companies are spearheading environmental science. or that Raytheon missiles bring us “peace through strength” or other such nonsense. This has taken a whole new leap in the Trump era of “alternative facts” and “fake news”, however you choose to interpret that. 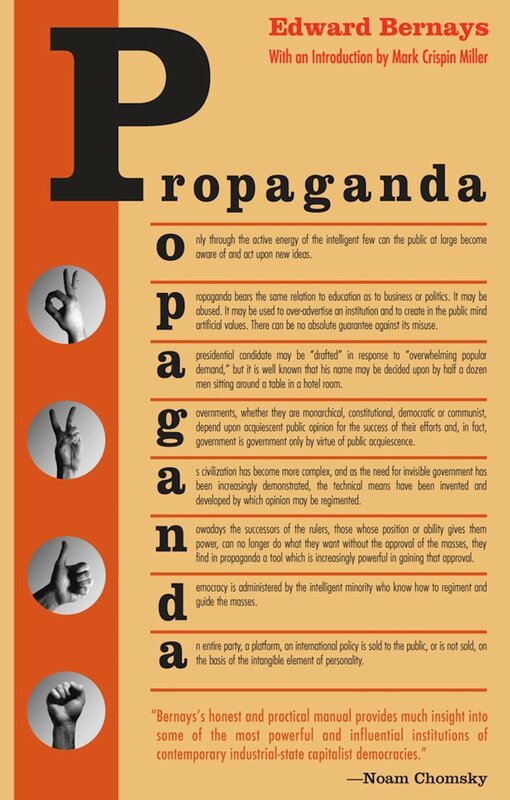 “Propaganda” by Bernays is simple, clever and informative, even in it’s 1928 retro presentation. It probably belongs on the shelf of any analyst, researcher, or propagandist. This entry was posted on June 17, 2018 at 5:47 pm and is filed under Book review, Hidden History. You can follow any responses to this entry through the RSS 2.0 feed. Does the government we have, which is increasingly ‘not of or by the people,’ -make that the sheeple- need a let’s say, a Propaganda Ministry on it’s own? Ha friends…what fer’..?as they say in the countryside. Because, the media, that is, the ‘news’ media has been more and more giving the fine citizens of America the militant views from the Department of Offence, er…Defense and the neo-con aggressive views from the State Department. From making it seem okay to be invading nations to continuing to peddle war and hate and threats to this nation and that, to keeping us divided by national origin or religion or race…well, The Beat Goes On. Look at who is being appointed to posts in the White House… and yet another silly, ignorant arrogant representative to the United Nations for the U.S.
And…does the media, the so-called news stations/networks question these bum? No, they all follow the current propaganda lines and treat these freaks with easy questions and kindness. In the 1950’s and at least through the 1970’s ( I don’t think it ended) we had Operation Mockingbird: the CIA had hundreds of so-called journalists and others at major newspapers in the U.S. and overseas peddling that agencies lines-propaganda. They actually paid these sell-outs of American values of freedom of the press and honest reporting. Now, most so-called reporters/journalist/analysts of news, and of what’s going on, happily tow the government lines and the American people are confused and just go on and let the crooks in the Senate/Congress do what they want. I can assure you that the vast majority of these people there in D.C. are amazed at how they can get away with anything- wars-division among us and so on. Look at them. Just enjoying themselves and both parties are in 90% agreement on everything.